This lesson shows you the steps on plotting (i.e. graphing) the graph of linear equations. If you are given a simple equation and have been asked to visualize it, you will very likely able to do it mentally. Now, if the equation gets more complex, you will soon find it difficult to visualize it mentally. This is where the coordinate plane is here to help. With several simple steps, you will be able to draw out any equation. As a start, we will use the equation for straight lines. Note that, straight line equation is also known as linear equation. You need to draw a x-y table to help you to record the coordinates of your points in orderly manner. Take note on how the coordinates of each point are calculated. In this lesson, only few points are used to plot the equation. For more complicated equations, you may need to get more points to have a complete picture of the equation. Welcome to a new lesson. After mastering on how to read and write coordinates, we can now use it to visualize the graph a linear equation. Let's say you are given the equation y = 2x + 1. This equation, by itself, may not makes much sense. But if we were to use the Coordinate plane to plot a graph of this equation, you get to actually see how this equation looks like. To do so, first, you have to draw out a table like this. This table is useful to store the coordinates of the point that you are going to calculate soon. Now, let the variable x to take up the first row of this table. Similarly, let the variable y take up the second row. With this, you can see that, these empty column here will used to store coordinates of one point. Now let's start filling this table. Let me put the value, 1 in the box right here. By doing so, you will have a point on the plane with it's x-coordinate = 1. But you have a problem. 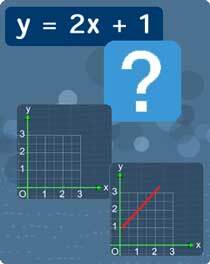 Though you have the x-coordinate as 1, you still do not know what is the y coordinate. This is where you will have to use this equation, to find out the y coordinate of this point when x = 1. Now, substitute x=1 right here, solve for y by first multiplying 2 with 1. You will get 2. 2 plus 1 gives you 3. Let's put this new value y = 3 into the table. It now means that, when this point's x coordinate = 1, the value of y coordinate for this equation is 3. With this newly calculated point, let us now adjust this point to the correct coordinates (1,3). Alright, you now have your first point from y = 2x + 1. To continue further, we will do the same thing for x = 2, x = 3 and x = 4. For x =2 , we will now solve this equation. Substitute x=2. multiply 2 with 2 gives 4 .Add 4 with 1. You will get y = 5. Let's put this value into the table. Now, you have a new coordinates (2,5). This point is located right over here. For x =3 , we will now solve this equation. Substitute x =3..Multiply 2 with 3 gives 6. Add 6 with 1. You'll get y = 7. Let's put this value into the table. Now, you have a new coordinates (3,7). For x =4 , we will now solve this equation. Substitute x =4. Multiply 2 with 4 gives 8. Add 8 with 1. You'll get y = 9. Let's put this value into the table. Now, you have a new coordinates (4,9). You see that these points forms a pattern here. Now, when we connect these points together, we will get a straight line. This line is the graph of y = 2x + 1. So, what you have learn showed you how draw the graph of a linear equation. Alright, that is all for this lesson. You can move on to the practice questions to test your understanding. You can start by going through the series of questions on graphing linear equations or pick your choice of question below.